In addition to tolls on I-5 and I-205, the transportation commission is exploring creating a 'seamless loop' of tollways around the Portland area. 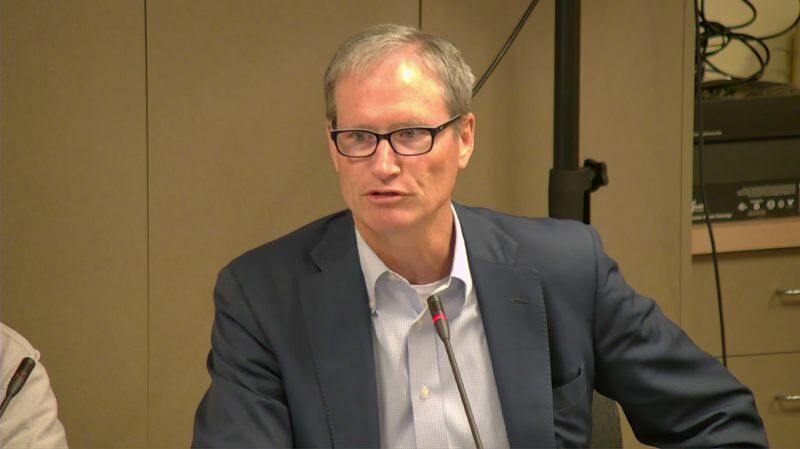 The Oregon Transportation Commission voted unanimously Thursday, Aug. 16, to seek federal approval for tolling Interstates 5 and 205 through the Portland area and to study creating a seamless loop of tollways around the city. Commissioners on Thursday authorized the Oregon Department of Transportation to analyze the feasibility of tolling I-5, I-205, Interstate 405, Interstate 84, U.S. Route 26, State Highway 217 and sections of U.S. Route 30. The tolled segments of each interstate would form a loop around the city to prevent diversion onto neighborhood streets and to maximize the reduction of congestion, said Commissioner Sean O'Hollaren. "In my view you create a donut, a beltway, a loop that doesn't have gaps in it," O'Hollaren said. "I think you need to look at how do you make a complete loop around the Portland Metropolitan Area that prices that congestion and that we are looking very seriously to what alternatives people have to get around that same property. Are we incentivizing carpooling to the max, are we creating ways people can get around? I think that should be something we look at." A $5.3 billion transportation-funding bill passed last year required the commission to study and consider tolling in the Portland metro area, but the law established no mandate to implement it. The transportation department convened a policy advisory committee to study the issue over eight months. 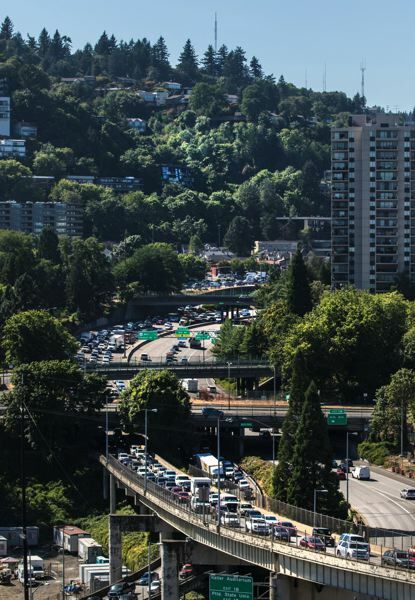 The committee on July 5 recommended starting a 'pilot program' to toll all lanes of I-5 between Northeast Going/Alberta Street and Southwest Multnomah Boulevard and the Abernethy Bridge on I-205. Revenue from the bridge toll would go toward paying for construction of a third lane on the two-lane stretches of I-205, from Highway 99 East to Stafford Road. Revenue from other tolls would be dedicated to expanding capacity, increasing the number of people in each vehicle or augmenting traffic. The idea behind a pilot program is to show how the tolls work at changing driver behavior and reducing congestion, committee members have said. One option to the commission is to make the tolls variable so that prices would be greater during higher levels of traffic and lower or nonexistent during low congestion periods, such as late at night. That strategy encourages drivers to get on the freeways when traffic levels are lower. The recommendation also calls for measures to mitigate the impact on low-income residents such as increasing access to public transportation and financial assistance. It would take several years to implement tolling just for the pilot program, ODOT officials have said. Meanwhile, Gladstone Planning Commissioner Les Poole and Republican Reps. Mike Nearman of Independence and Julie Parrish of West Linn are trying to get an initiative on the 2020 ballot that would require voter approval for tolls on existing roadways in certain circumstances. Initiative Petition 10 would require voter approval for tolling existing roadways when proceeds of the tolls are used to pay only for "new net capacity" on the road or bridge on which the toll is assessed. That essentially means building additional lanes. For example, under the initiative, the state could toll new lanes on I-5 without seeking approval from voters, but if the state wants to toll the existing lanes, voter approval would be required. The commission made its decision Thursday during a meeting in John Day. The commission sometimes takes its meetings on the road to reach out to constituents around the state and see the state of the transportation system. Last month, the commission convened a listening session in Portland to hear about the I-5 and I-205 tolling proposal. Forty-three members of the public came forward to speak. There were no public comments at Thursday's meeting.